The event, held on November 22 in Donostia, focused on applications and advances in information and communication technologies applied to industrial manufacturing environments. 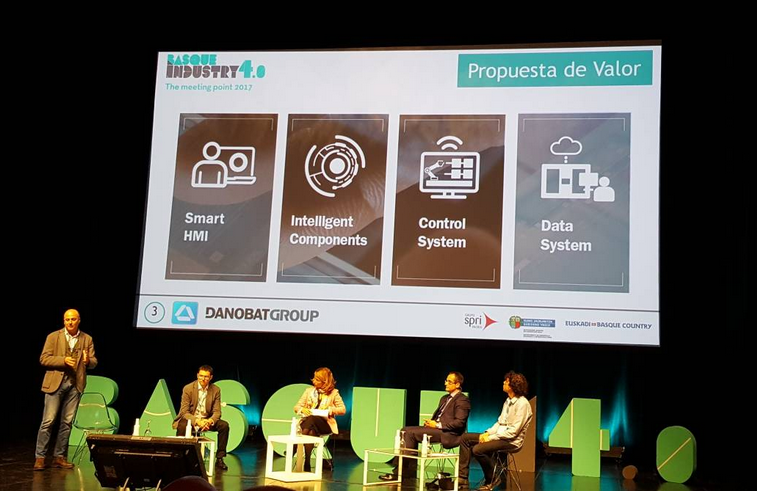 DANOBATGROUP presented its digital value proposal applied to the machine tool sector in a specialised presentation entitled "sectoral applications of Industry 4.0". The technical director of SORALUCE, Javier Torrella, was responsible for presenting the complete proposal of the group, consisting of a Smart HMI, an intelligent interface that facilitates the operation of equipment and provides information on the status of machines and operations. Likewise, Torella also explained the performance of the Control System for managing automated manufacturing lines, as well as features of the Intelligent Components, machine-integrated devices to improve precision, reliability and productivity of the equipment. Finally, the expert presented the functions of the Data System platform for machine monitoring on the basis of real cases that are currently operating on SORALUCE´s equipment, a company belonging to DANOBATGROUP. By means of specialised presentations, workshops, round tables discussions, interviews and exhibition areas, the congress at which more than 40 exhibitors attended, has served to boost cooperation between businesses.